Whether you keep your A/V components separate or stack them on shelves, unless they're well vented, these delicate components can be damaged by the excessive heat they generate. Remove heat right at the source: Optimized for components on open shelving, the quiet Single Fan Component Cooler turns on automatically when satellite/cable boxes, receivers and other heat-generating components get too hot. Just place the component cooler directly on top of equipment vents. The low-profile unit fits beneath most equipment, and rubber discs are included to raise the height of stacked equipment if necessary. The quiet, internal fan activates automatically when temperatures generated by hot-running equipment reach damaging levels. 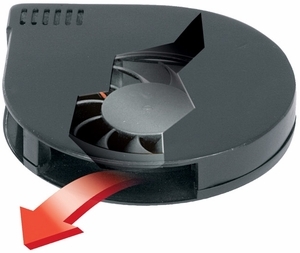 The Single Fan Component Cooler activates automatically at 90� F and turns off at 88� F, but since its quiet fan runs at only 19 dB, it won't disturb your enjoyment of your entertainment equipment.